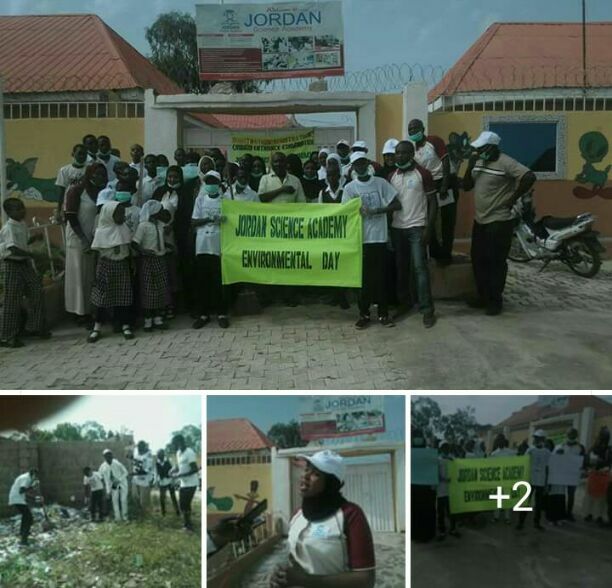 As part of its contribution to environmental cleanliness and protection, Jordan Science Academy, Ungwan Dosa, Kaduna, Northwest Nigeria on Saturday demonstrated that, its own charity begins at hime. This was done by a way of cleaning its immediate environmental exercise thereby making the school the first school to do so in the state in recent times. In recent times, environtalists have heightened campaign on the need to protect the environment, plant trees and regular clearing to check the green house emission and desertification which are threatening the safety of global village today. Jordan school, with the state of the art educational equipment and manageable size of 185 pupils and students introduced a yearly sanitation exercise to help keep their school and host community clean. Vice Principal (Admin), Ms. Fadilah Saliu who spoke with newsmem during the exercise said, it was meant to create awareness for a culture of cleanliness in the host community and the school environment. To Fadilah, “she believe that Jordan school environment and the community should be kept clean for healthy lives. We are aware of the state government’s effort to keep the state clean, so what we are doing today is to join hands in creating the awareness. If the environment is clean, diseases like malaria, cholera outbreak among others could be decisively death with. “Apart from that, it is important to also inculcate to the children the habit of keeping their environment clean. As you can see both the Primary and Secondary sections are involved in this exercise and we hope to keep this exercise on annual basis,” she disclosed. In a chat with journalists after the cleaning exercise , Alhaji Uba Ahmed ,the Proprietor of Jordan Science Academy ,Kaduna said the idea behind the exercise is to extend the concept of “Keep Environment Clean” to our host Ungwar Dosa Community . Though Ahmed said the management has inculcated the culture of cleanliness in the pupils and students of Jordan Academy, he maintained there is a need to extend this culture of cleanliness ” to members of host community. He however urged others schools to emulate similar exercise adding that, doing so will help to reawaken the weekly environmental Cleaning exercise in the state and other parts of Nigeria.